On Thursday, Verizon Wireless(s vz)(s vod) will light up 34 more small cities and towns with LTE, bringing its 4G coverage to three-quarters of the U.S. population. The network will then be live in 371 markets, just 29 communities shy of its 2012 400-market goal. Verizon also said it would expand its existing coverage on Thursday in 38 other market, and though it didn’t reveal an exact number of POPs covered, the U.S. Census pegs the current population at 314 million, meaning Verizon has placed at least 235 million people under its 4G umbrella. The carrier’s year-end target is 260 million POPs covered. Verizon remains well ahead of the competition. AT&T has launched LTE in 51 markets. By its last official count AT&T(s t) was covering 74 million people, though it’s launched in several new cities since and plans to double its coverage by year-end. Sprint(s S) just rolled out its first five LTE regional clusters in July and plans to add a sixth city, Baltimore, by the end of August. It expects to have a 123 million people covered by the end of the year. T-Mobile won’t launch until 2013. The new Verizon markets are: Hot Springs, Ark. ; Redding, Calif.; Valdosta and Waycross, Ga.; Centralia and Danville, Ill.; Parsons, Salina and Topeka, Kan.; Alexandria and Monroe, La. ; Pittsfield, Mass. ; Battle Creek and Muskegon, Mich.; Mankato and Worthington, Minn.; Joplin and Sedalia, Mo. ; Bismarck, Grand Forks and Minot, N.D.; Chillicothe, Ohio; Reading, Pa.; Aberdeen, S.D. ; Laredo, Odessa and Texarkana, Texas; Brattleboro and White River Junction, Vt.; Charlottesville, Va.; Longview, Wash.; and Eau Claire, La Crosse and Manitowoc, Wis. The markets in which Verizon has expanded its 4G coverage are: Los Angeles and Santa Barbara/Santa Maria, Calif.; Orlando, Fla.; Macon/Warner Robins, Ga.; Bloomington, Champaign/Urbana, Decatur/Effingham and Springfield, Ill.; Elkhart, Ind. ; Des Moines, Iowa City and Sioux City, Iowa; Dodge City, Garden City and Great Bend, Kan.; Lexington and Louisville, Ky.; New Orleans; Boston; Minneapolis/St. Paul, Minn.; Missoula, Mont. ; Las Vegas; Manchester/Nashua, N.H.; Las Cruces, N.M.; New York City; Cincinnati; Greenville/Spartanburg, S.C.; Sioux Falls, S.D. ; Chattanooga, Tenn.; and Salt Lake City/Ogden, Utah; Roanoke, Va.; Charleston, W.Va.; and Green Bay, Wis. Additional areas include: Little Rock, Ark., expanding into Batesville, Ark. ; Tallahassee, Fla., expanding into Thomasville, Ga.; Burley, Idaho, expanding into Twin Falls, Idaho; Chicago, expanding into DeKalb, Ill.; and Cedar City, Utah, expanding into St. George, Utah. I am in Puerto Rico (10/10/2012) with a Verizon DROID RAZR. The best signal I have had is 1G. What’s up with the map showing 3G in most of Puerto Rico? Frustrated in PR. Its so damn expensive per gig, who cares how good their coverage is. 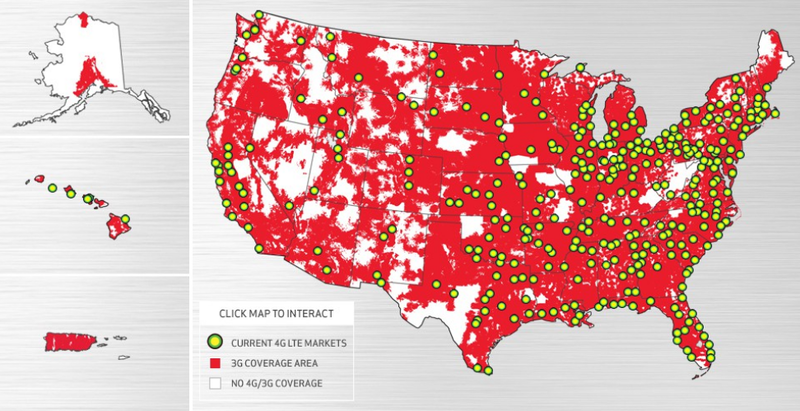 The PR map looks just like all of Verizon’s other coverage maps – made up with little bearing to reality. I’d be much more interested in seeing a real coverage map of their 4G area rather than these little dots. It is starting to get irritating that every news site authors an article every time Verizon launches “a market” with 4G. What they’re considering markets is very different from other providers. Verizon seems to be calling every little village a market and putting out PR pieces that other providers wouldn’t bother with.